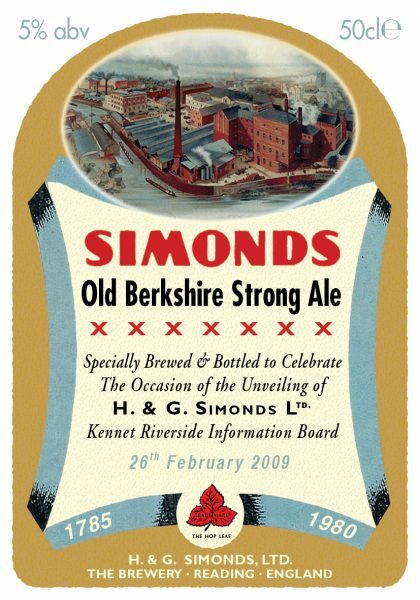 This brief history of H&G Simonds Ltd is based on research by Tony Corley of Reading University, both his ‘Road to Worton Grange’ produced for Courage Breweries in 1980 when they re-located the brewery operations from Bridge Street to Worton Grange close to the M4 Motorway and ‘Simonds Brewery at Reading 1760-1960’, published in the Berkshire Archaeological Journal Vol. 68 of 1975. These were extended, illustrated and then published by Raymond Simonds to celebrate the unveiling of the Kennet Riverside Information Board in 2009. If you would like a printable quality pdf file of this booklet in either A4 or ½ A4 booklet format, for education or private use only, then please contact me using the link in the footer. You can read this online here, by using the flip book tools below this image. This is the bottle label of our special ‘Commemorative Brew’, brewed for the occasion by Chiltern Breweries.